Volunteer lettuce in the strawberries. Six weeks from the winter solstice and our long spell of clear, warm weather has continued pretty much unabated. The pussywillows have been blooming for three weeks and the willow trees are starting to leaf out. Oak buds are beginning to swell. My stepmother, in her Zone 9 garden only thirty-five miles away, has had jonquils for a couple of weeks and the grass is green and beginning to lengthen. My daffodils are just starting to poke leaves above the ground (my garden is Zone 7 and on a north-facing slope), but I’ve seen robins and other birds that show up in early spring. 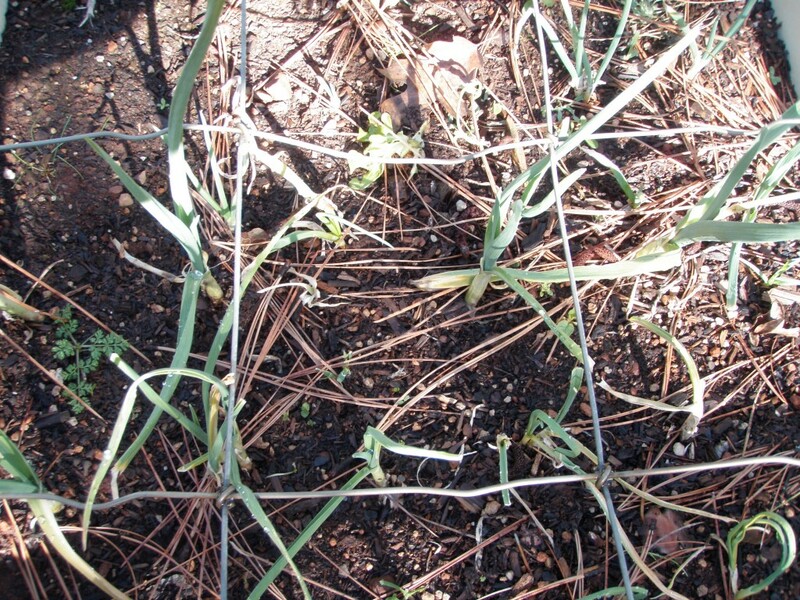 Potato onions, perennial leeks and garlic; under wire to protect from marauding free range chickens. At this time of the year, the gardening itch sometimes becomes so overwhelming it can drive me crazy. I know better than to plant – even cool-season crops shouldn’t go in the ground for another six weeks – but the urge is pushing harder every day. Warm-season crops are another story; there’s no question that if you plant them too early, you risk losing the whole crop to a late frost. And the veggies that like warm toes really need warm soil, both to germinate and to grow. 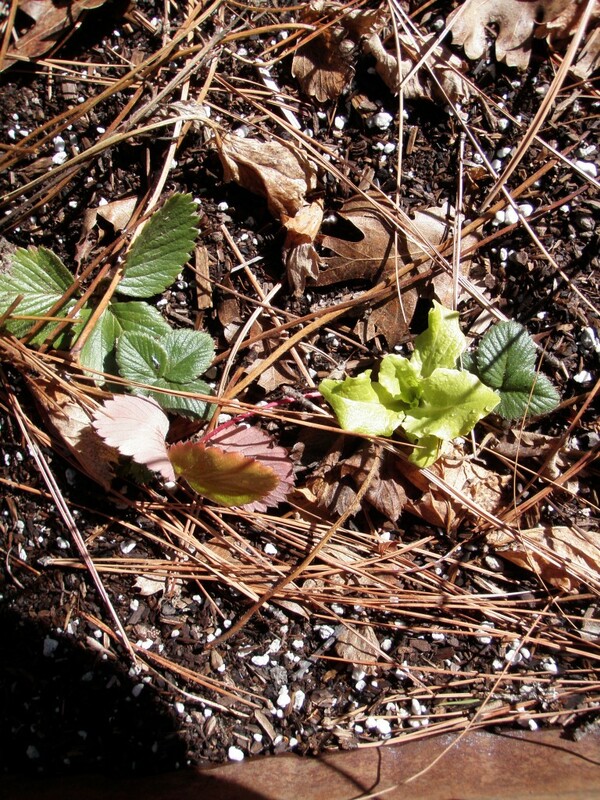 Plant them when the soil is still cold and they’ll rot, fail to germinate or germinate and then just sit and sulk until it warms up. But cool-season plants seem a bit more flexible in that respect. Greens and lettuce are especially tolerant of temperatures that would normally be considered less than ideal. Last year, I gave in to temptation and started snow peas, lettuce, broccoli and such in January. They did great – even the fourteen inches of snow that hit when they were about three weeks out of the ground didn’t really faze them. So I wonder, how many of the rules about cool-season planting can be broken? Or at least bent a little… Besides, if there are volunteer lettuce seedlings in the strawberry bed, I should be able to plant some lettuce, right? Right?